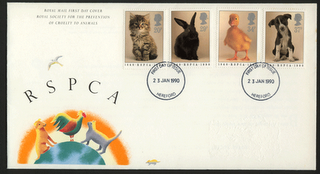 One of my dogs is not well so was thinking of the RSPCA today and found these stamps.. Thought you might like to see them if you don't have them. A nice cover.. ...I will say I have taken an address label off, so the cover is not perfect, but the stamps are. Issued a few years ago and somewhat a clean style.. not like many of todays issues. If you want these for your collection just email me at cddstamps@gmail.com and first email will get them if you include your mailing address. Finally, yes, I reinstalled my scanner software and thus the cover above.. but don't forget I am still looking for articles and scans from you on your stamps topic.. see my GV1 article some weeks ago. Sorry I have not been around much these past few weeks..... and it will be that way for at least the next few weeks.. I am going to India in 7 days.. and if any of you are in Hyderabad, Bangalore or Chennai and have some time to catch up with me I would be so pleased to meet you.. and bring stamps if you let me know in advance. Finally, I am so far behind on my emails, I am embarassed.. so please forgive me ..I will write eventually or send stamps if I owe you.. please dont let that stop you sending me ideas and emails. Hello, I am back in Sydney.. hot (temperature wise that is).. compared to chilly Melbourne.. but to stamps.. I hope you like this stamp.. or rather this block and the lovely postmark. I was looking out of the window on the plane and was shocked by the drought conditions I saw below me.. really quite amazing.. dry dams and the main dam which supplies Sydney's water is really so low it is, to be honest, quite worrying. Years ago I drove to Canberra and on the main road into Canberra was this big expanse of water.. I forget the name of the lake.. but it is dry.. I mean totally dry.. awesome site.. shocked me I can tell you.. just goes to show I am better off in an aisle seat and just sleeping through the flight.. Thankfully we have the most conscientious politicans who really care.. and know what is happening out there... oops sorry, am I being cynical or what.. I am lost for words myself.. and don't want to get political but we have a problem and it seems no one is doing anything about it.. except for the pollies talking BS.. but hey we all know that is life don't we..... well what do we expect from Pollies eh!!!!!!!! ... less of this .. these stamps then.... I chose them because they show a water dragon.. could get on my enviromentalist soap box now couldn't I what will happen to these creatures.. no water for them??? Sorry for poor picture.. got home to find my scanner on the blink.. so took this with my camera and uploaded the picture.. apology for not usual quality.. another problem to resolve.. but stamps will keep me sane ...... wont they ?? Hello, nothing to do with stamps.. well I will try.. No postings for last few days because I had to come to Melbourne and the Yarra Valley.. quite lovely area.. lots of wine... 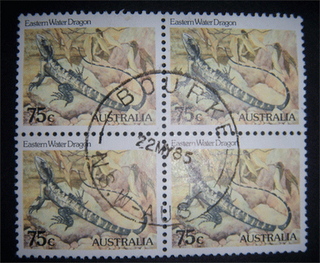 I remember the Australian Wine on Stamps issue... I think that was the theme... and the Yarra may have been one of the stamps.. not having any stamps around me right now I cannot check. So this to say I will write when I get back to Syndey in a few days.. tomorrow I am at the Australian Open Womens Final.. corporate function ... should be good.. who can tell me the winner.. email me cddstamps@gmail.com before the result is known and I'll find a set or FDC of the Wine stamps as a prize. well yes it has to be the water... interestingly enough if you look at the Millenium issue from the Royal Mail back in 1999 / 2000 you will find that the Millennium Projects (2nd Series) stamp issue was Fire and Light.. well you have light with fire.. as my picture a few nights ago showed... and the 3rd series was in fact Water and Coast. yes I can see the linkage.. but for me tonight I mention water only becasue it rained here last night.... might not happen for another few years :-) but it did rain... thankfully. So why am I telling you this. 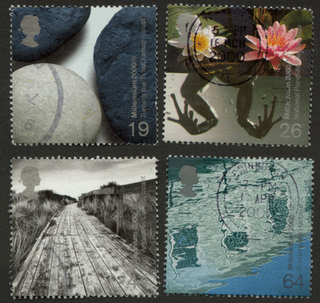 well I am not sure to be honest .. it seemed a theme to show some stamps.. and to show how close stamps are to everyday life at times.. if you think of it that way. Ok so I am tied.. I lost my internet connection yesterday.. no the lines were not burnt out with the fires but they might have well have been.. No internet.. how I had withdrawal symptoms anyway .. all is well.. back to stamps.. I hope you enjoy these..
What a wonderful series.. the Millennium issue.. too many I think.. and I do think they were streched for ideas.. but still an interesting collection in their own right. I have a few gaps and have way way back tried to encourage trades to fill those gaps. If you have gaps write to me and I will be happy to trade two for one.. you send me two and I'll send you one.. no no no only joking .. the other way round.. if you can help me fill my gaps I'll gladly give you two Millennium stamps for any one of my gaps. anyway this was quite spectacular scary too I might add. 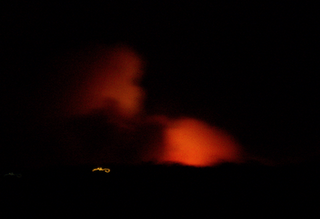 This is the tree line and the fire is roaring way up into the sky. Gerswin never had it this hot did he??? His music was hot I'll give you that.. but as for temperature.. wow.. our weather site says 39 C today.. I'll tell you it feels hotter than that.. and while I really enjoy the heat I also enjoy a nice cool air conditioned home in which to study my stamps.. not so today as air con is broken.. had to make do sorting used stamps.. what a tough life.. there is a tip for you.. don't work with mint stamps in the heat.. perspiration from your fingers will damage the gum.. and even if you think you are only using the best of twezzers.. beware.. sooner or later you will touch the stamps.. not good for the stamps.. trust me..
ok ok some stamps.. I thought I'd show you these tonight..GB 1994..issued as part of a series I believe to commemorate the four seasons... no not the band.. stay with me people,.. the Spring, Summer, Autumn, Winter seasons.. Wherever you are, with snow, rain or sun.. enjoy your stamps and remember to work with them considering the temperature and ambient conditions. Hello, well how pleased was I with the response to last nights question.. seems many of you (in the US) are also not too pleased to be losing your city postmarks.. and what surprised me was that even a state capital was losing its postmark..... that is Olympia in Washington State. As some of you have written to me, this seems to be a trend and a consolidation of the US postal service give the growing presence of the internet and the decline in the use of the postal mail. Times they are a changing!! who said that ?? Some more stamps tonight. I had many to chose from I must say. I just received my GB Royal Mail Beatles MS. You have seen that no doubt so am not showing it, and anyway I actually don't think highly of it to be honest. Anyway I think they are interesting and maybe useful to someone? Write me at cddstamps@gmail.com if you want them.. first email gets them..
Where did I get them you ask.. well from a guy I met at a speaking engagement in Kuala Lumpur a few months back. We sat next to each other at lunch and in conversation found out we both collected stamps. He sent me a rather large box of stamps to use as give aways and for my Children's Corner. I am very well stocked now. So if you know children who are starting to collect stamps and want some, don't hesitate to get them to write to me.. details on my web site at http://www.cddstamps.com and I will send free stamps. Lets encourage young collectors.. collectors young and old.. Finally, just a comment as to my plans to travel to India in a few weeks.. If it happens I will be in Hyderabad, Bangalore and Chennai.. and if anyone wants to say hello.. I would be thrilled to hear from you.. maybe we can arrange to meet.. small world that it is. Oh... really finally.. don't forget my invite to write a piece for this blog with the GB GVI stamps I showed a few days ago as a prize.. if you haven't read that piece do go back a few days and have a read.. if for nothing else than what I think is a useful text on stamp quality. Hello,, well that was the start of a heading in the article in the newspaper article I just read..
de-prioritized............. I won't tell you the rest because this is the question tonght.. What do these places / towns / cities have in common???.. Greensburg PA: Bridgeport Conn: Marina, Calif: Newark NY: Pasadena, Calif:: Olympia, Wash: Kinston NC. Hello, tonight a few CTO (Cancelled to Order) stamps. One sees a lot of these from some countries. I don't collect them yet I know many people do. These are rather nice I think, but then I have always had an interest in aviation as you may know. Since these are not powered aviation, and CTOs, they are not within my collecting interest so I thought maybe someone out there would like them. No quiz, just write to me at cddstamps@gmail.com and first in gets them. Do include your mailing address.. please. As my plans firm up I will let you know, especially if you are interested in meeting .. I could even bring some GB and Australian stamps with me. Hello, well as I sit in the sweltering heat wishing for rain, having heard about the winter storms, snow and bad weather in certain parts of the US I wonder who is spending more time with their stamps.. you, stranded at home maybe in the US or me trying to cool off... ok.. not me . I do hope all my readers in the US are ok..and that any power failures are quickly restored and that you and your families are safe. Some are not I have read and that is sad to hear. 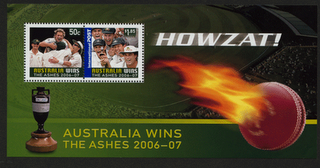 As for stamps I did manage to buy the new Cricket Ashes stamps today. This is the MS..
if you want to win this here are the prize questions.. What was the name of the captain of the side that won the second Ashes series? What team did he play for? and, Was this the first or second Ashes win for that countries team? 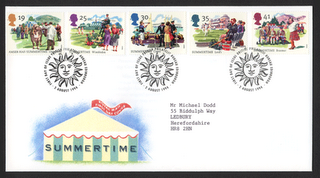 Hope you like the stamps..Rather interesting perfs on this MS.. it might be special.. I have no idea. Don't forget my writing of a few nights ago about the GB GVI stamps and the prize for writing an article, that if selected will win that stamp or set of stamps if the overall winner. when I need to be... yes in the case of tonights stamps I am Canadian.. 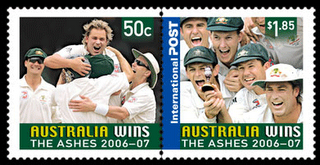 I am actually surprised Australia Post only issued 2 stamps to commemorate Australia's Ashes win over England.. after all is was a white wash 5 - 0 win.. Anyway.. for a really serious stamp writing I hope you had time to read last nights piece.. and I do look forward to hearing from you and receiving your ideas and writings ..
GB SG 511 - "a nice solid stamp"
Hello, How are you all.. well I hope.. I have not written about stamp quality for a while and thought it was time I did. I am motivated to do this by the fact I bought a stamp on eBay recently and when it arrived it had a lovely ( derrgghh) crease in it. I have to give full marks to the seller who immediately refunded my money. Sad that they tried to sell it without an accurate description. The description they gave included the words "fine" and "excellent".. it was far from it and I am going to be generous and say they did not know their description was not what they thought it was. 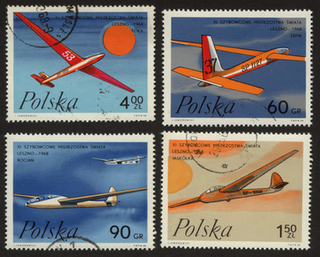 here are 4 stamps from my collection..
some brief comments.. I could write for hours but I doubt you have the time to read..
bottom right... nearly lovely postmark , clean, good perfs, quite well centred, no tears or thins. Now compare these 4 with the copy that is for auction.. ok, so you want a space filler... go for the auction example.. ( a bit of advertising here if I may.. my GB specials on my web site will include this stamp and in better quality and many other high value GB......... http://www.cddstamps.com/ and all for a fraction of the price you will pay at auction for this quality of material.. and quite frankly this auction example is only a space filler.. harsh of me.. maybe .. as long as you are aware and then happy, then ok, that is fine with me too.. but please don't think you have a quality stamp with near catalogue value. 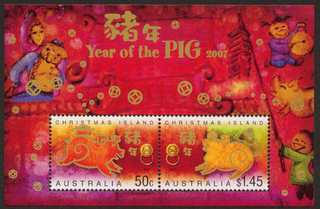 Now.. how to get a better copy of this stamp..
Hello, first many thanks for all who wrote and correctly said that Jack Nicholson was not born in the year of the Pig.. 4th entry was Lea from Washington State in the US .. I feel for the first three of you..and those after 4th entry of course ...... but thanks for writing to me.. and yes Peter raffles is a wonderful place.. even still has the Somerset Maughan spirit in many ways. What about this picture.. 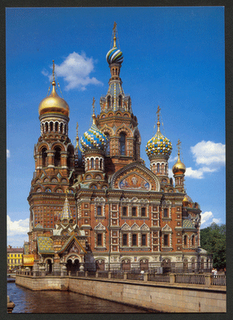 I was sorting some stamps today and came across this card someone sent me.. it is a beautiful building don't you think.. where is it.. ??? email me at cddstamps@gmail.com, including your mailing address and 8th correct entry will get a prize of some sort.. sorry haven't decided what yet.. hey, new idea.. you tell me what you would like as a prize.. stamp selection or FDC..?? ..
Also.. have a look at http://used-covers.blogspot.com/ I often show covers .. here are some used ones.. very different and interesting you may agree. which of these rather well known people was not born in the Year of the Pig: Lucille Ball, Elton John, Bryan Adams, Ernest Hemingway ( I was at the Raffles Hotel yesterday for those of you who know your Singapore history) Jack Nicholson, Woody Allen????? oh, by the way.. I am definately not a Year of the Pig person.. one of the traits of a Year of the Pig person is ...." They dislike being made to travel too far from familiar surroundings, unless it is a trip to the countryside"... derrghhh not me eh!!! 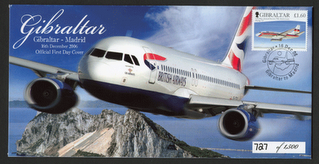 Hello, and many thanks for all your emails about last nights Gibralter cover.. a few got the aircraft type wrong I have to say,.. but don't worry.. it was a difficult question... the aircraft on the stamp is a Boeing 737. well done Jane from Canada for the first correct answer...... will mail you something in a few days. what about this cover.. 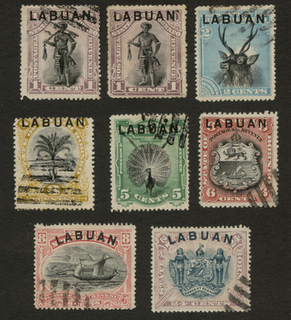 I like this.. not only for the cover but also for the stamp. I got this from Buckingham Covers. I have written about them before.. have a look at my web site http://www.cddstamps.com/ for the links to them and more information, or just go to http://www.buckinghamcovers.com/ .... pretty good site if you ask me. 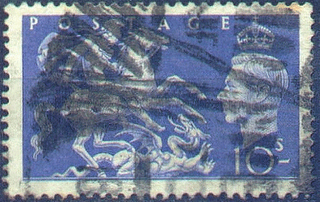 This stamp was issued only in a miniature sheet along with 5 1st class machins. So the stamp is not that common and to get it on its own on a cover probably makes it more less common. 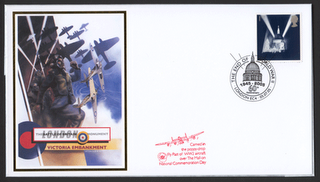 A nice addition to my collection not only for the stamp but also because it has an aircraft related theme and was carried in a Lancaster by the Battle of Britain Memorial Flight in the Poppy Tribute fly past on July 10th 2005. 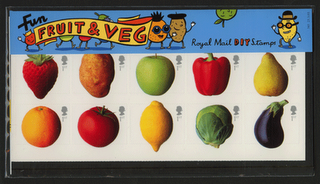 Enjoy your stamps.. anyone got the Beatles stamps, issued by the Royal Mail.. used?? do send me a scan.. or you will have to wait until I get mine..
Hello, a few weeks ago I told you how I had my credit cards stolen and I had to pick pocket my wifes' purse to get a credit card to pay for a cover I wanted to buy. Here is the cover. Rather nice don't you think. I did offer a clue at the time, as to the country I bought the cover from, but unless my memory is fading in old age I dont think anyone got it. Well now you know.. it was Gibralter. OK.. next prize question.. what is the aircraft type ... of the aircraft on the stamp itself.. for bonus prize tell me the aircraft type of the aircraft on the actual cover..
What new covers and stamps have you purchased or found in trades recently? Anything you think others would like to see ?... do send me a scan and I'll try to show them. I did receive another rather nice cover in the mail today.. will show that tomorrow..
Hello, I received in the mail today my copy of the GB Journal from the GB Philatelic Society - excellent magazine and accompanying news booklet... I couldn't help but notice an article about stamp prices - comparing prices from different catalogues / sources. 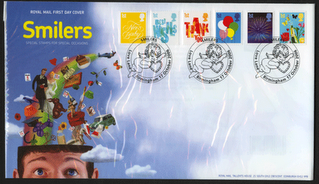 I mentioned the SG Collect British Stamps catalogue last night and this was used as one reference. Others were Stoneham, and a couple of dealers price lists. 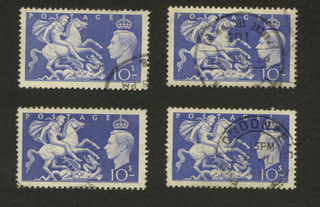 Interesting to see that for some example stamps the SG prices were much higher than Stoneham's and the listed dealers. No surprise really. The point is take care when considering what price you think your GB stamps are worth or for that matter how much you think you can sell them for. On the other hand take note of how much of an increase there is for some GB. I mentioned presentation packs last night. Tonight I have this cover I picked up while in the UK. I think it will go up quite considerably in the next few years. These smilers stamps have a history - as far as I know - of being quite good "investments"
This cover is catalogued by SG at £4.00.. Lets see what it is in 4 or 5 years.. will we be reading my blog then I guess is the question but seriously, look back at the 1990 smilers issue.. this now has a GB cat price of £26.00. I am too tired to do the DCF ( Discounted Cash Flow) on this but it seems ok a pricing to me. I am not going to try selling on eBay for a while... try searching on "Smilers"; you might be quite surprised....... even for some bargains as I see it. continuing a theme from my UK trip.........While I was at the stamp dealers in Brimingham I bought a copy of the 2007 GB " Collect British Stamps"...... I thought it would be useful to have.. why I don't know.. but you know.... you see these catalogues and for some unexplainable reason just add it to what you are buying. This afternoon I was looking at the prices of some of the stamps.. some quite astounded me.. especially used and presentation packs. I have said on many occassions that used GB will go up in price because there are not that many being bought for postal use.. and it seems I am being proved right.. but what about some of the presentation packs.. this one for example.. and yes it is an exception although many others are 10 times their purchase price already, and it is only 2 to 3 years since they were issued. The catalogue ( ok, I know SG prices are considered inflated but all the same...) the catalogue price for this presentation pack is £65 ........ honest.. I kid you not.. so while I am not collecting GB ( my New Years resolution well... easier than giving up wine, women and song eh!!!)... maybe I will re think.. and at least get a presentation pack of each new issue.. after all, one may well prove to be a worthy investment.. I am told the Valentines day booklet ( I think it was) will be a short issue and is a good buy) only time will tell.. and of course SG pricing and the willingness of others to pay the high prices..... best keep watching eBay.. where there is, in my view, a sense of real market pricing at work. Hello, well I am back in sunny Sydney.. lovely and hot here today... a bit different from London I can tell you.. although I enjoyed every minute of my three days there.... and a busy time I had from the minute I left Sydney.. 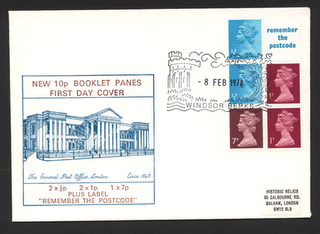 It is the 1978 10p booklet issue, catalogued in SG Concise as X843m... and with a Windsor franking as you can see. Nice addition to anyones collection don't you think. I also got a bag of GB.. hundreds of stamps.. to big for my carry on baggage ( Heathrow is very strict these days as you may know) but they arrived safely in Sydney I am pleased to say... I will try to sort over the coming days / weeks.. I will put some into my Childrens Corner ( see http://www.cddstamps.com , a few, hopefully, into my collection and maybe.... keep reading over the coming days and weeks... a few for prizes.. Flight back was brilliant as well.. lots of champers again.. well it helps you sleep is my excuse... jet lag.. at my age.. never!!!!!!!!!!!!!! Stamps .. what about stamps.. well thank you to all who wrote saying they had received their Christmas Competition prizes, Thanks to everyone who read the blog in 2006 and I hope I can make it interesting enough for you to keep reading it in 2007 and that each of you tell one friend to read it as well.... . oh and finally.. have a read of Roy's (Machin Man's blog.. see link http://machinmania.blogspot.com/ ) it is brilliant.. and yes he talks about my trip to see him.. you will have to read to learn more.. of course you might also enjoy his material on stamps..